MONDAY, March 2, 2015 (HealthDay) -- Eating nuts, including peanuts and peanut butter, may help you live longer, a new study suggests. Researchers looked at the diets of more than 200,000 people in both the United States and China, and found nut consumption was linked with a lower risk of premature death from heart disease and other causes. 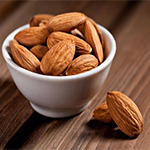 The findings lend support to previous evidence on the heart-healthy benefits of nuts, said study researcher Dr. Xiao-Ou Shu, associate director of global a and professor of medicine at Vanderbilt University in Nashville, Tenn. However, Shu said, the finding is "based on an observational study," so the researchers cannot prove cause-and-effect with certainty. "That said, the totality of evidence from nutrition and health research suggests that nut and peanut consumption can be considered a healthy lifestyle choice," she said. The study is published online March 2 in JAMA Internal Medicine and was funded by the U.S. National Cancer Institute. Shu's team asked men and women about their intake of nuts, including peanuts and peanut butter. Peanuts are often less expensive than other nuts, an important feature for the many low-income men and women who were studied, Shu said. The group who ate the most nuts, peanuts and peanut butter reduced their risk of early death from heart disease and all other causes by about 20 percent, compared to the group eating the least, she said. "Because peanuts [which do not grow on trees] are much less expensive than tree nuts, as well as more widely available to people of all races and all socioeconomic backgrounds, our study finding suggests that increasing peanut consumption may provide a potentially cost-efficient approach to improving cardiovascular health," Shu said. How many peanuts should one eat, exactly? The U.S. group in the top 20 percent of peanut consumption ate more than 18 grams a day, or about 0.63 ounces -- roughly 2 tablespoons of shelled peanuts, Shu said. The researchers followed the men and women for various time periods, ranging from a median of 5.4 years to more than 12. The researchers looked for an effect on nut intake and death from cancer and diabetes, but did not find one. Peanut butter will work as well as peanuts and other nuts, Shu added. The study did not have information on whether the nuts were salted. However, she said people should consider the health risk associated with high salt intake when choosing nuts. What's behind the benefit? "Nuts are rich in nutrients, such as unsaturated fatty acids, fiber, vitamins, phenolic antioxidants, arginine and other phytochemicals," Shu said. All are known to help heart health, she said, by reducing inflammation. Sonya Angelone is a registered dietitian in the San Francisco Bay area and a spokesperson for the Academy of Nutrition and Dietetics. She said the new research "supports the recommendation to make nuts a part of a healthy dietary plan and to eat them every day." Angelone would give this advice to anyone asking about eating nuts for heart health. "Be sure that the nuts consumed contribute to a healthy diet and are not from candy bars, sugar-covered nuts or in rich peanut sauces on fried foods," she said. Eating them that way would probably negate the benefits, Angelone noted. She also would encourage people to eat a variety of nuts, not just peanuts.